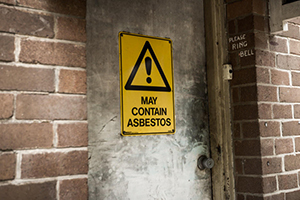 Despite being banned in the UK in 1999, exposure to asbestos is still having devastating effects on the health of tradesmen according to Alpha Surveys. Approximately 50% of private properties have a chance of harbouring asbestos, and many plumbers who work in these homes aren’t aware of the risks. This is particularly alarming as the Health & Safety Executive (HSE) have predicted that the number of deaths caused by mesothelioma, an incurable type of cancer linked to asbestos exposure, is set to peak in 2018. As mesothelioma takes several years to manifest, many of these deaths will have been caused by exposure prior to 2000. Nonetheless, the number of deaths from this disease has exceeded estimations made in 2005, rocketing by nearly a third and causing the HSE to bring its peak forecast forward. Between 2013 and 2027, more than 53,000 British people will die from mesothelioma, many of them tradesmen who are yet to be exposed to harmful fibres. Many plumbers are unaware that they still risk coming into contact with asbestos 100 times a year, and a report by the HSE found that less than a third of tradespeople surveyed knew the correct procedure for handling asbestos in the workplace. Due to its fire-resistant qualities, asbestos was frequently used as insulation for pipes, pumps, valves and gaskets and much more. Every plumber will at some point replace any of these components, and potentially release harmful asbestos fibres into the air. If done without proper protective equipment, these fibres are given direct access to the lungs, where they could develop into mesothelioma over a period of 10 to 50 years. Health and Safety Laboratory conducted alarming research in 2007 during which plumbers recorded their exposure to asbestos throughout a sample week. Of those who recorded no contact with asbestos during the sample week, 69% had actually been exposed to it. There is no current regulation requiring homeowners to remove or control asbestos on their property, and many aren’t even aware of its presence. 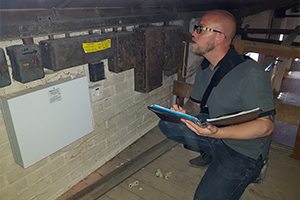 We always encourage people to conduct a full asbestos survey to protect themselves and anyone who may come into contact with asbestos containing materials on their property. There are a number of steps that plumbers can take to protect themselves and their employees from asbestos exposure, the most vital of which is wearing proper Personal Protective Equipment (PPE), which musn’t be re-used. Avoid eating, drinking or smoking near the work area and minimise distribution of dust potentially containing asbestos by using a rag or vacuum cleaner to tidy up instead of a brush. Alpha Surveys are leading asbestos surveyors, providing expert independent advice and sampling results. See their website for knowledge and insight on topics such as this.